The mechanistic target of rapamycin complex 1 (mTORC1) is a serine/threonine kinase complex that functions as a major regulator of cell growth and metabolism in response to energy levels and nutrient abundance1. In the presence of nutrients, mTORC1 is recruited to the lysosomal surface by RAPTOR and activated Rag GTPases. Once on the lysosomal membrane mTORC1 is activated in parallel by the Rag GTPases together with the Rheb GTPase. The Rheb GTPase itself constitutes a point of regulation as its activity is governed by the TSC1/TSC2 complex which drives the hydrolysis of GTP to GDP in Rheb, thereby causing its inactivation2. The activity of TSC1/TSC2 and thereby mTORC activation by Rheb is regulated by a plethora of signals from environmental cues including growth factor presence and energy levels3 (Figure 1). While much is known about the upstream signaling that converges on mTORC1 localization and activation, it is not fully established how Rheb localization is regulated. It has been suggested that Rheb localization to endosomes and/or lysosomes is mediated by farnesylation of the C-terminal CaaX motif4. Other studies question the specificity and strength of this localization signal, and suggest that Rheb resides at various endomembrane structures, including the ER and Golgi5. In the case of Rheb residing on Golgi membranes, it is proposed that close proximity with mTORC1 on lysosomal membranes is mediated via interconnected surfaces between these organelles6. In this preprint, the authors attempt to shed further light on the regulation of Rheb localization and provide evidence for a mechanism where farnesylation of Rheb recruits it to ER membranes where it mediates its mTORC1 activation effect. Utilizing exogenous expression of GFP-tagged Rheb, the authors noticed a network-like distribution. They found that this signal overlapped with the ER-marker Sec61, indicating that Rheb might localize to ER tubules. Furthermore, lysosomes were frequently observed close to Rheb positive ER-structures, providing evidence that ER-resident Rheb could be positioned in close proximity to mTORC1 on lysosomes. Deletion of the CaaX farnesylation motif inhibited ER localization of Rheb, and also abolished mTORC1 activation. The authors then studied the activity of different hybrid versions of Rheb, constitutively targeted to the plasma membrane or to the ER. Interestingly, constitutive targeting of Rheb to the ER reduced its ability to activate mTORC1, even more so than did constitutive targeting of Rheb to the plasma membrane. Subcellular fractionation experiments revealed that Rheb is detected mainly in in the cytosolic fraction, evident of only weak interactions with membranes. Thus the authors conclude that farnesylation of Rheb enables its weak interaction with the ER membrane and that this transient and reversible interaction is essential for the interaction with, and activation of, mTORC1. FIGURE 1. Simplified overview of the recruitment and activation of mTORC1 on lysosomal membranes. 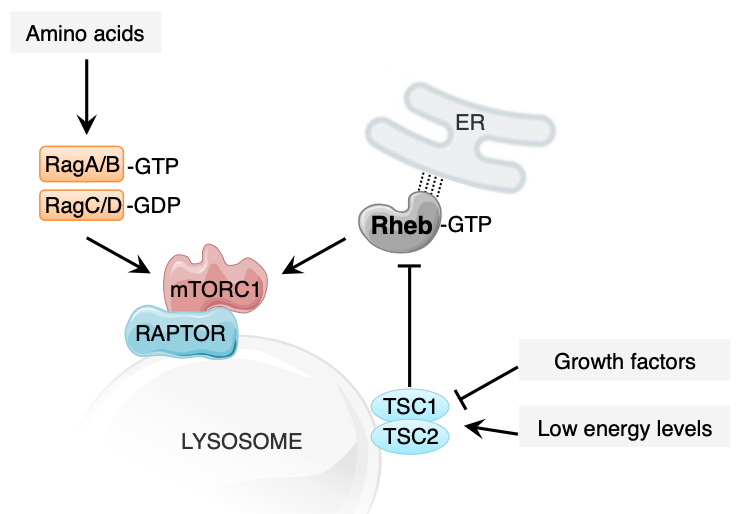 mTORC1 is recruited to the lysosome by RAPTOR and the RAG GTPases, and then activated in a parallel manner by RAG and Rheb GTPases. In this preprint, a model is described where Rheb exerts its activation effect on mTORC1 from its position on ER tubules. The activation of mTORC1 is governed by several environmental input signals, conveying information about amino acid levels, energy levels and growth factor presence. As Rheb and mTORC1 are major regulators of cell growth and survival, these genes are found to be overexpressed in many forms of cancer1. Thus, it is important to understand the molecular regulation of Rheb localization and mTORC1 activation as this could provide information on how to interfere with this signaling in order to combat disease. While a lot of questions still remain, this preprint adds to our understanding of Rheb localization and describes how a very weak and transient interaction can be of functional importance. I also appreciate that the authors of this preprint highlight the importance of critical analysis of immunofluorescence data, as fixation and preservation can influence antibody signal and structure preservation. Especially with broadly distributed proteins, false positive colocalization can often occur and it is of great importance to back up immunofluorescence data with other evidence. What would be the explanation of the inability of Rheb to activate mTORC1, when constitutively localized to the ER? If the activation of mTORC1 is the result of transient interactions, why can these interactions not be obtained via cytosolic Rheb, or transient interaction between Rheb and the lysosome? What is the advantage of ER interactions? While the data in this preprint present evidence that Rheb localizes to the ER rather than the lysosome, there is a lack of discussion on how this reconciles with data showing Rheb localization to golgi6. Does farnesylation of Rheb mediate its interaction with both organelles? Furthermore, do the overlapping signals between lysosomes and ER correspond to contact sites between the organelles, and is this the sites of Rheb-mTORC1 interaction? Do these contact sites change upon refeeding, similar to what was reported for contact sites between lysosomes and Golgi? The localization pattern of GFP-Rheb looks rather distinct from the localization of endogenous Rheb. Is this simply due to a stronger signal of the GFP construct or could the overexpression of GFP-Rheb affect its localization and/or organellar structures? Overexpression of Rheb would presumably lead to a constitutively active mTORC1, which has been shown to induce ER stress7. Do subcellular fractionation of cells expressing GFP-Rheb show the same Rheb localization as WT cells? The model presented in this preprint does not mention the localization of the TSC1/TSC2 complex. Is it possible that this complex also resides on ER tubules to mediate its regulatory effect on Rheb, or is this regulation also facilitated by transient interactions between lysosomal TSC1/TSC2 and ER bound Rheb? Laplante M, Sabatini DM. mTOR signaling in growth control and disease. Cell 2012, 149(2): 274-293. Castro AF, Rebhun JF, Clark GJ, Quilliam LA. Rheb binds tuberous sclerosis complex 2 (TSC2) and promotes S6 kinase activation in a rapamycin- and farnesylation-dependent manner. J Biol Chem 2003, 278(35): 32493-32496. Kim SG, Buel GR, Blenis J. Nutrient regulation of the mTOR complex 1 signaling pathway. Mol Cells 2013, 35(6): 463-473. Saito K, Araki Y, Kontani K, Nishina H, Katada T. Novel role of the small GTPase Rheb: its implication in endocytic pathway independent of the activation of mammalian target of rapamycin. J Biochem 2005, 137(3): 423-430. Buerger C, DeVries B, Stambolic V. Localization of Rheb to the endomembrane is critical for its signaling function. Biochemical and biophysical research communications 2006, 344(3): 869-880. Hao F, Kondo K, Itoh T, Ikari S, Nada S, Okada M, et al. Rheb localized on the Golgi membrane activates lysosome-localized mTORC1 at the Golgi-lysosome contact site. J Cell Sci 2018, 131(3). Ozcan U, Ozcan L, Yilmaz E, Duvel K, Sahin M, Manning BD, et al. Loss of the tuberous sclerosis complex tumor suppressors triggers the unfolded protein response to regulate insulin signaling and apoptosis. Mol Cell 2008, 29(5): 541-551. 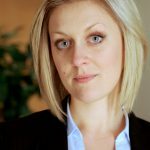 Thank-you for sharing our research with your readers! An updated version of the manuscript has been uploaded to bioRXiv (bioRxiv 513473; doi: https://doi.org/10.1101/513473). We have added new data and have provided a more thorough interpretation of our results and extra discussion of how they relate to past publications in this field. In the course of making these revisions, we made significant efforts to address the questions that you raised. One important point of clarification is that although Rheb is prominently localized to the endoplasmic reticulum, there is also a cytosolic pool that we interpret as being in the act of exchanging between other intracellular membranes. Our data is thus consistent with a model wherein transient interactions of Rheb with lysosomal membranes support mTORC1 activation. This interpretation also aligns with the evolutionary selection for a relatively weak, non-selective, membrane association mechanism for Rheb.